NOTE: All our 1040 models include an update to ensure they'll also work with the new 40+ plastic balls (as well as with all the old balls). This robot is the next step up and is great for intermediate and tournament level players. 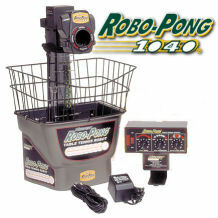 Includes all features of Robo-Pong 540 plus oscillation and more powerful speed/frequency controls. Bucket Extender expands ball capacity for longer continuous play. The light weight yet sturdy construction makes it highly portable, making it easy to take with you wherever you go. Since this unit is placed on top of the table instead behind it, it can offer you a much wider ranges of angles, allowing you to simulate more senarios of real play. Note: the 1041 (also called 1040A) is is a 1040 with some enhancements, to improve the ball delivery mechanism. Limited one-year warranty. Parts available worldwide. 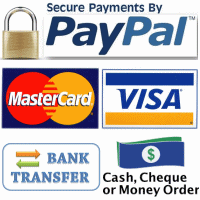 Newgy Robots come with a full and comprehensive 1 year Australian warrantee. No doubt everyone can benefit from the use of a robot, if they use it sensibly. Some of the great benefits of table tennis robots are outlined below, so if you want to be convinced, or need to convince your parents or coach that a robot is worthwhile, read on and you will see the greatest benefits. Assuming you have learnt the basic strokes, you need to practice them to get better. Robots are ideal for this, because they have the ability to give you the same ball over and over again, allowing you to (1) practice the stroke, (2) fine-tune the stroke, (3) speed it up once you have mastered it and (4) see what effects some minor adjustment can make. A real practice partner will almost certainly not give you the same ball continuously, so if you start missing you will not know if the ball came a little different, or if you made an error in you stroke or footwork. Of course a real practice partner will also likely run out of energy or will get bored...something you do not need to worry about with a robot! If you are keen to get your own or other kids interested in table tennis, then a robot is a real treat. Kids love this sort of thing. You can use it as a treat after some serious training, or as a demo to get new kids interested, or just have it around as a bit of fun. At starting prices similar to games consoles, surely the use of a robot is a lot healthier for kids, instead of sitting in front of a monitor for hours! If you thought table tennis does not require much fitness or endurance, think again! Once you have learned some of the basic strokes you will realise you need a lot more than just an arm movement to play a proper stroke, and you need to move your feet to get into position to play your strokes properly. A robot setup to oscillate or programmed to shoot out balls to specific locations, can feed you balls all over the table, over and over again, at a speed and frequency of your choice. 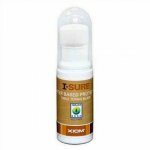 This will give you a great workout, for either losing weight or gaining fitness and/or endurance. Not only will the weight loss and improvement in fitness/endurance improve your game, but it will no doubt improve your coordination and strokes enormously as well. After speaking to a coach who does a lot of group coaching, it is clear how valuable a robots can be. To keep costs down, only very simply robots can make group coaching so much easier, and require a lot less helpers or other coaches. You can simply set the robots up for a particular stroke that the kids need to learn, and allow them to practice it over and over again, while you walk around the group and offer advice where needed. In this case a few smaller robots, costing only a few hundred dollars each, can be much more valuable then a single more complex unit. Apart from allowing you to practice your individual strokes, most robots can be set to oscillate or even programmed to shoot out balls to specific locations. This can be highly valuable to practice your footwork, and speed it up once you have mastered the basics. This again is especially useful for kids, and their coordination is still developing, and footwork can be taught right from the start. Although a robot is no substitute for a partner to play with, it sure is a lot better than not being able to play at all! For those that play competition, you will know everyone has a weakness. Once an opponent find this, and has the ability to use it against you, it can mean the end of the game. A robot can be setup to play the balls you have trouble with, so you can practice it over and again, until you you turn it into a strength. Similarly other players will have trouble with a particular shot, and will try and to stop you from playing this shot. 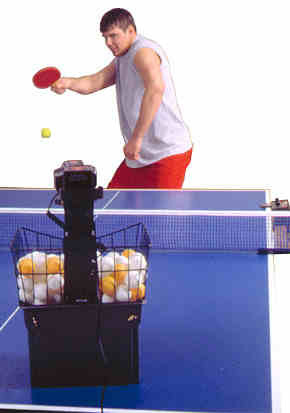 A robot can be set up to play any shot, so that you practice how to generate a particular stroke no matter what stroke your opponent gives you. A club that has a robot available is a likely attraction for new players. It can be a very important facility that you can offer to your members, and can offer great benefits as outlined above. These are the major advantages of robots, there are no doubt others that can be added to the list. Apart from the initial cost, there is no doubt a robot can be put to good use no matter what level or style player you are. Robots like the Newgy 540 are priced similar to a games console, and would no doubt offer many more benefits and plenty of fun, so they are well worth considering. Note: For Australia only. Via regular mail. Thank you!